Depending on whom you speak with, canine food allergies are considered both common and rare, and puppy food allergies even less common. While allergy to fleas is the most common and atopy (or hay fever) is the second most common, food allergy is ranked third in incidence. The incidence is estimated to be one to ten percent of the total dog population. Diagnosis, however, is difficult and may be complicated by other allergies such as flea allergies, atopy (inhaled allergies to pollens, etc.) or even contact allergies. There are poisonous people foods that your puppy will react to with vomiting and diarrhea or worse, but food allergy is something else. Allergy is an over-reaction of the immune system. Antibodies are specialized cells of the immune system that protect the body from foreign invaders, such as viruses and bacteria. If these cells become over-protective, they can misrecognize harmless substances like proteins in your dog’s food and attack. The heightened response to these substances, called allergens, results in the allergy symptoms your dog suffers. Those dogs that are food allergic react to one or more ingredients in a diet. Usually, the culprit is a protein like beef, milk, corn, wheat, or eggs that are common protein ingredients in commercial pet foods. Dogs can react to any protein in the food, as long as they’ve been sensitized to it. Making things even more complicated, not every ingredient is clearly listed on the pet food label. Dogs theoretically can develop allergies to anything, just like their human owners. To develop an allergy, the dog must have been exposed to it in the past. This primes, or sensitizes, the body’s immune system to overreact. In other words, a dog that has never been exposed to chicken will not suffer a reaction on first contact but may develop an allergic response with subsequent exposure. The typical food-allergic dog is two years old or older and suffers intense all-over itchiness that occurs year round. Canine food allergy less often results in vomiting or diarrhea. There may be an increased risk in West Highland White Terriers, Miniature Schnauzers, Golden Retrievers, and Shar Pei dogs. Note that any dog can develop the condition at any age, even puppies as early as six months old. As in other allergies, avoiding the allergen — the food ingredient(s) — relieves the symptoms. A 10-to-12-week-long veterinarian supervised elimination diet diagnoses food allergy and identifies the culprits. The dog is fed a special diet that contains unique protein sources that he's never before eaten, and so should not be allergic to. Commonly, this limited antigen diet contains only one unique protein and carbohydrate, such as rabbit and potato, or venison and rice, that your puppy has never eaten before. By only feeding these unique ingredients the pup should not have previously been sensitized and so any food allergy signs should go away. The reversal of the signs also helps diagnose the condition. Once the dog stops itching, the ingredients from his original diet are added to the diet one at a time to see which one(s) cause symptoms to return. When the culprits are identified, you simply feed your dog a diet without the offending ingredient. The term "hypoallergenic diet" means it minimizes allergic reactions, and since every dog is different, there is no such thing as a one-fits-all canine hypoallergenic diet. The FDA says diets labeled to control allergies can only be prescribed and distributed by veterinarians, and there are several therapeutic foods designed for this purpose on the market. Understandably, some owners are reluctant to put their pet through the tedious diagnosis process of an elimination diet that still may not pinpoint the problem. 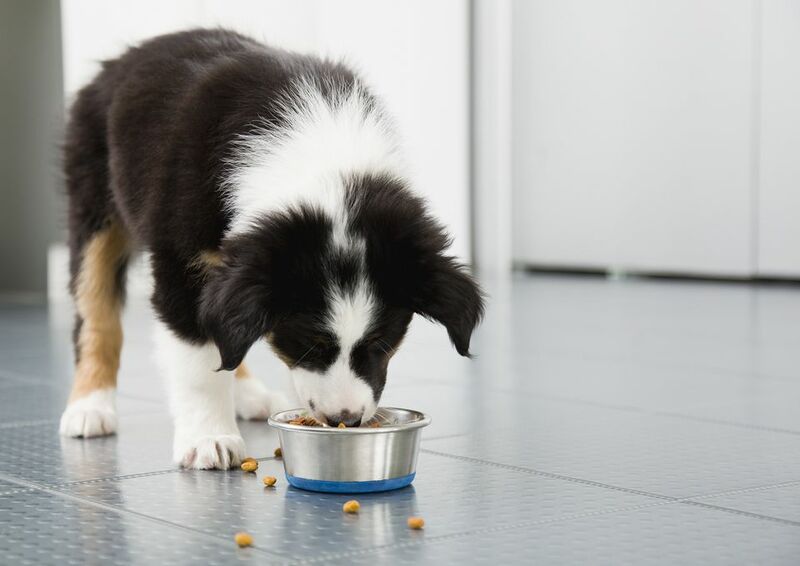 Since the food elimination trial can be costly, oftentimes as soon as the signs of discomfort go away, owners elect to just keep the dog on that food. It’s important to discuss options with your veterinarian. Therapeutic diets prescribed by your veterinarian are typically higher cost, and this may also be a factor. Some food-allergic dogs do well when fed lamb and rice-based commercial diets, as long as they haven't previously eaten these ingredients. Just remember that lamb and rice-based diets often contain other ingredients, which may still cause your dog to react. And over time, dogs may become allergic to any unique ingredient. Allergies cannot be cured, but they can be managed if you can identify the cause of the signs. There can be many causes for itchy skin and vomiting, and only a veterinarian can diagnose canine allergy. Identifying the allergen(s) and treating the signs should be a joint venture between you and your veterinarian, to best serve the health of your dog. Can Your Puppy Get Cataracts?